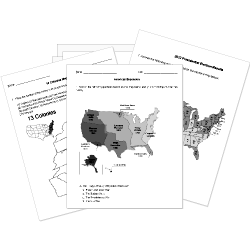 You can create printable tests and worksheets from these Grade 4 American Revolution questions! Select one or more questions using the checkboxes above each question. Then click the add selected questions to a test button before moving to another page. Who hired the Hessian soldiers to fight the Revolutionary War? What did the Americans call the Coercive Acts of 1774? was the President of Congress and had the largest signature on the Declaration of Independence. helped get France to support and join forces with America. was the English General who surrendered to American Army during the Battle of Yorktown. was a spy for the Continental Army who was caught by the British and hanged. was an officer in the Continental Navy and is known as the Father of the American Navy. Why did the British march south to continue fighting the Revolutionary War? was the a commander of the American Army in the South. was a former slave killed at the Boston Massacre. Where were the Hessian soldiers from? Why was the Battle of Kings Mountain so important? Why did the Cherokees agree to help the British in the Revolutionary War?